There are 58 Soil and Water Conservation Districts in Florida, all organized by local people for the purpose of promoting and encouraging the wise use, management and general conservation of soil, water, and related natural resources. An elected five-member, non-partisan board of supervisors, who volunteer their services, manages each soil and water conservation district. Florida has 290 supervisors. Soil and Water Conservation Districts are non-taxing and are supported by maintaining relationships and partnership with organizations, government agencies, and receive voluntary contributions. To assist and enable soil and water conservation districts of Florida to accomplish collectively what they cannot accomplish individually. To assist soil and water conservation districts in their efforts to provide service and assistance in natural resource management and conservation. To provide a direct link between soil and water conservation districts and the National Association of Conservation Districts, as well as, the State of Florida. 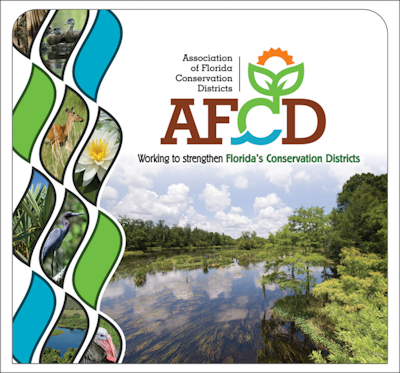 To strengthen AFCDs legislative presence; which will in turn, strengthen the legislative presence of each soil and water conservation district in the State of Florida. To build and enhance the capacity and capability of soil and water conservation districts in the State of Florida to include leadership development. To promote conservation education among the youth in public, home, and private schools of the State of Florida to include public speaking, environmental studies, land judging and other areas of conservation. To promote and increase public awareness of Florida’s soil and water conservation districts as the source for natural resources management. To implement effective two-way communication between AFCD and local soil and water conservation districts. To expand AFCDs available resources for programs and services. Help increase conservation throughout the state of Florida. There’s no better way to make an impact than to become an active advocate yourself. We offer programs which promote and encourage the wise use, management and general conservation of soil, water, and related natural resources throughout Florida. The FWC needs your help documenting where gopher tortoises live. 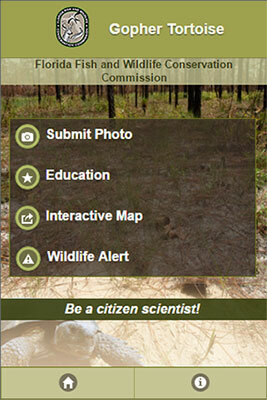 You can help by downloading and using the “Florida Gopher Tortoise” smartphone application (app). With this app, you can record the location of gopher tortoises you may see in your yard, neighborhood, or crossing the road. This information will help FWC biologists better understand where populations of gopher tortoises live. The app also contains gopher tortoise information and a fun quiz to test your knowledge, learn more about this protected native Florida species, and help protect and conserve gopher tortoises. With your help, FWC will be able to better document where gopher tortoises are living within our Florida communities, and how we can work together to protect them. The free app is available for both Android and iOS smartphones. GO HERE TO DOWNLOAD.